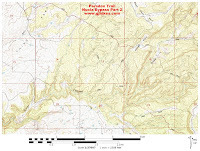 The Nucla Bypass Section of the 118 mile long Paradox Trail begins off of the 25 Mesa Road just north of the town of Nucla where it follows a mix of newly constructed singletrack and old jeep roads for just over 12 miles until it reaches Z26 Road where the Spring Creek Section of the Paradox trail begins. The Paradox trail branches off of the 25 Mesa Road just under 1 mile north of the town of Nucla. As soon as the trail leaves the highway the route splits. 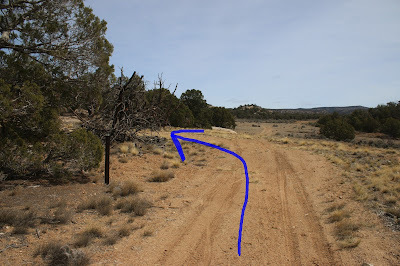 At the time of this post there weren't any trail markers showing which route to follow. Both routes converge on top of the ridge so either way will work. 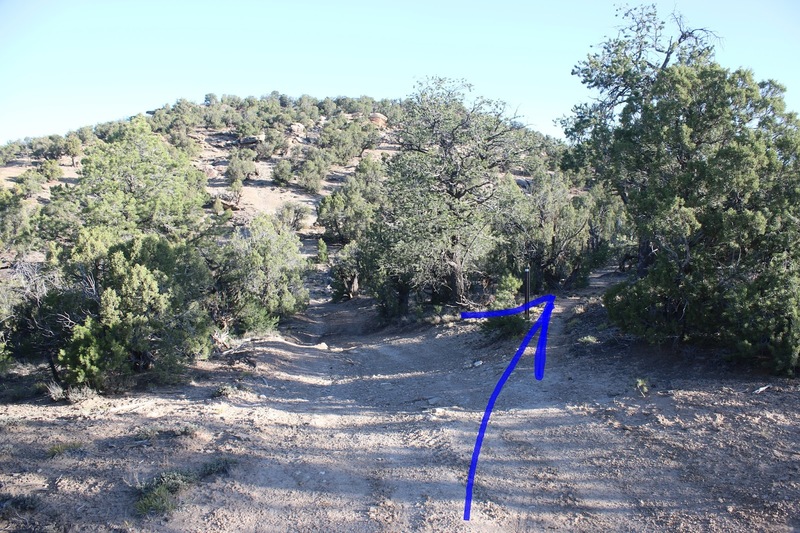 We took the left fork because there was a juniper tree in that direction that had a freshly cut branch that looked a whole lot like trail maintenance to us. A little past where the 2 routes reach the ridge and join up a short stretch of singletrack branches off on the right. The singletrack ends up reconnecting with the old jeep road after a short distance and follows it on up the hill before branching off once again. The next couple miles of singletrack works its way across each hill from one drainage to the next continually gaining elevation as it goes. The singletrack was built with mountain bikers in mind with easy to moderate features as the trail transitions between packed dirt and slickrock. For those that aren't really interested in riding the entire Paradox trail this section of singletrack is a lot of fun doing as an out and back. We were real surprised to see a tarantula in this area. This is the furthest north and maybe the highest elevation that we have seen one. The trail reaches its highest elevation right around the 3 mile point. The elevation profile shows all the ups and downs of the Nucla Bypass Section. All total it has 1,948 feet of climbing and 2,198 feet of downhill going in this direction. 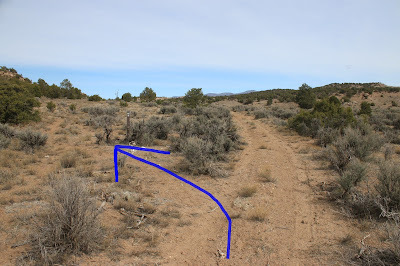 The trail travels generally downhill for a mile and a half from its highest point and near the 4.5 mile spot it enters a wash and begins contouring around the hillside. Around the 5.3 mile point the trail turns to the left and begins a steep climb to get out of the valley that it is in. If you miss this turn you will reach private property before going a half mile and have to backtrack to this point. When we took the photos for this post they were in the process of reconstructing the route up the hill and adding a series of switchbacks to make it more rideable. Up to this point we had been able to ride up every hill that we came to. For the next 7 miles the trail follows existing jeep roads that take it in and out of one drainage after another. There are 4 or 5 short sections of hills that will probably require hiking your bike. It is guaranteed to give you a full body workout. The route has a lot of trail markers but there are still a few places that might cause you to scratch your head a little. A GPS with the latest GPX file loaded is the only way to go. 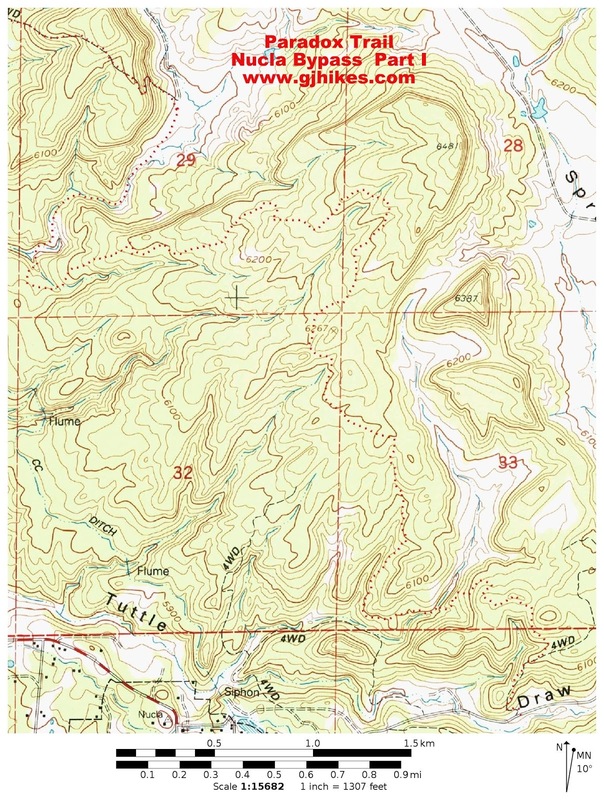 Its hard to find a good topo map that has all the jeep roads for this area. 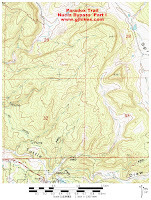 We broke the trail down into 2 separate maps so that we could zoom in and give more detail. The last 3 miles or so get a bit easier as the trail smooths out somewhat, the hills aren't quite as steep and there are some awesome downhill stretches that are a nice change of pace. 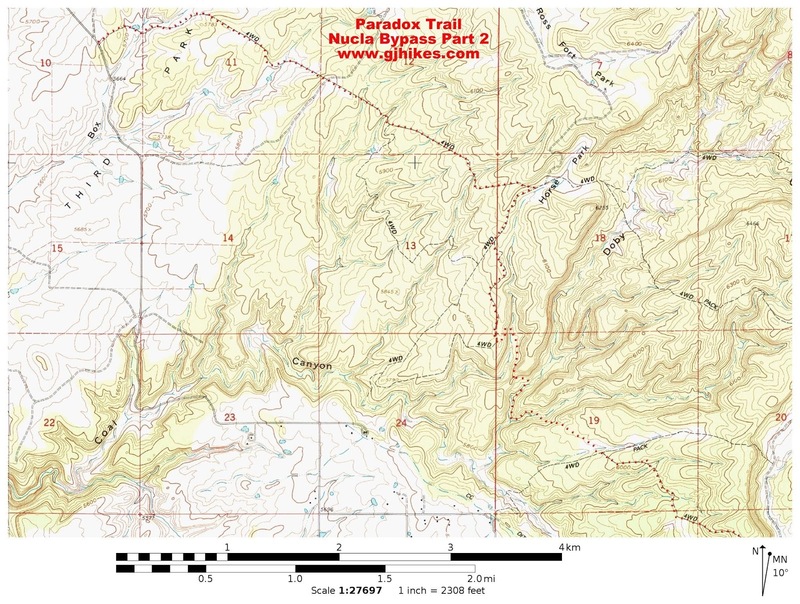 The Nucla Section of the Paradox trail comes to an end when it reaches the Z26 Road. There is an alternate route that goes right through Nucla that makes use of both paved and graveled roads that had to be followed until the new sections of singletrack were completed after the infamous Paradox trespass reroute. 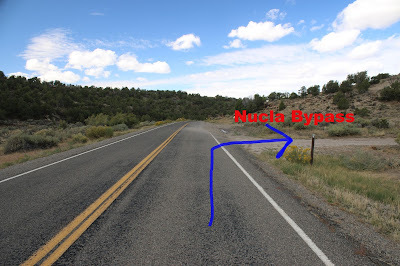 When we did the Nucla Bypass for this post it ended up taking 2 attempts. On the first attempt we lost the trail at the 5.3 mile point and had to turn around. On the second attempt we came in from the other direction. As it turns out we lost the trail on the first attempt because we had gone as far as it had been constructed. At least we can say that we have ridden it in both directions. If you would like to see it for yourself then all you have to do is grab your bike or 'Take a hike'.